On January 4 of this year, the USA quietly rolled into a new era in the plumbing industry, virtually eliminating lead from plumbing products. The change finally ended eight years of speculation and doubt which started when California introduced independent legislation to ban lead in plumbing products, during the term of Arnold Schwarzenegger as The Governator. That legislation was enacted in 2010 and for the last four years has split the USA into states with lead-free legislation and those without. This year, the legislation has gone national in the USA, but as we explore here, the effect on the Australian plumbing market is not clear-cut, nor is the benefit to consumers of plumbing products. It is highly likely that the average consumer has never thought about the contamination of their water by the products that are used to transport and control the water they use every day. The complexity of water and the impact of where it has been before it reaches us at the tap is incredible, with people having strong feelings on all sides, so it is understandable that the US made the move to remove lead from its plumbing products. The truth is not so simple, with more than 200 substances controlled by the Australian Drinking Water Guidelines. If you are concerned, or have a customer who is concerned, look into installing a filtration system for your drinking water – it is a small price to pay for peace of mind. If you are specifically concerned about lead, check that the filter has been third-party tested (by someone like NSF) to genuinely remove lead. Why the ‘lead free’ movement? The primary materials used in the plumbing industry are copper-based alloys, polymers and stainless steel. They all have pros and cons, but brass and bronze copper-based alloys offer exceptional properties for products in contact with water. They offer long life, good strength and ease of manufacture. They are also largely non-toxic, with the exception of the small amounts of lead and arsenic which are used primarily to enable the manufacture of components. You’ll find copper based alloys used in taps, fittings, valves and water meters, some of them machined from bar, some cast in liquid metal and others forged – they all use different alloys specific to the manufacture, but they all use copper, zinc and other minor elements like lead. The main advantage to lead containing alloys is the ease of machining. Whether turning or milling, the lead particulates in the metal structure and creates a natural weakness for the spiral of metal that comes off during machining. Without the lead, that spiral just gets bigger and bigger, jamming up the machine and causing frequent stops for cleaning. The lead also acts as a lubricant during the machining process. When you take it out, the tip of the tool suddenly becomes very hot, which dramatically reduces the life of the tool or decreases the quality of the finish you can get on the product. Is removing lead a good thing to do? Yes and no. Around the world there has been a steady move away from the use of lead in any product including paint, automotive components and plumbing, and there is no acceptable safe level of lead in humans, so the removal of exposure is necessary. However, countries around the world are taking different approaches to controlling the issue. Most are placing tighter limits on the amount of lead that comes out of the product during its lifecycle, i.e. reducing the amount of lead that gets into the water we might drink. This is done by testing the product out of the factory for lead leaching in an accelerated test. In those cases, there are still questions about the test itself. It may pass the initial test but it cannot predict what could happen after five years in your home. Questions have also been raised about the process. Samples might pass the test, but what about the actual product? Under the current US law, it is still possible to have lead in plumbing products, and tests have shown that those products could leach lead at a rate which is unacceptable under the tests used in other countries. Ultimately, there is a need to strive for the complete removal of lead, but this needs to include both limits on the use of lead and tests for the leaching of lead. From the manufacturing point of view, while removing the lead makes everyone safer (no-one has to handle the lead in the first place), it does make the process much harder. Machines have to run harder and as a consequence, use more energy to make the same product. It is also possible that the imposition now in place on brass and bronze will drive the use of less acceptable materials, or materials with consequences that are also negative. Nothing is happening on this topic in Australia. The standard which protects us from contamination from products in contact with water (AS4020 Products for use in contact with drinking water) was last revised in 2005 and there are no intentions, at this time, to modify that document. The Australian plumbing regulation has been superior in many ways to the US for some time and time will tell if a revision to our document will be required. Until the ‘Lead-Free’ legislation was introduced in the USA, copper based alloys had levels of lead up to 8%, while in Australia, an interim step had been taken to reduce the maximum allowable lead to 4%, with typical products containing around 2%. USA ‘lead-free’ still allows a maximum of 0.25% of lead. In Europe, the Germans, English and French are currently working on a different method altogether. Instead of eliminating lead, they have conducted extensive testing on a limited range of copper-based materials to determine if there are any toxic leaching issues over the long term. They have also elected to conduct this testing on water from four regions in Germany to ensure a wide range of results (although perhaps the exclusion of water from France or the UK is causing the delay in the adoption of this idea in those countries). The result is a definitive list of alloys which are allowed to be used in the construction of plumbing products. This change is likely to have a more direct impact on Australian products, since many imported products come from Europe and will most likely begin to comply with this legislation. Those products will still need to be tested and comply with AS4020 and the dezincification requirements in the Australian plumbing codes. What are the downsides to this change? Simply removing the lead causes other issues. At the time of the California legislation, there was a serious cost-implication to this change, since the best solution on the market at that time was a higher-copper content alloy, and if you watch the commodity markets, you will know the price of copper. As you can imagine, no-one wants prices to rise, so this left manufacturers in a difficult position. In order to recoup some of the margin that manufacturers lost in those early days, there is a renewed rush of scientific work going on around the world to develop alloys which meet the requirements, but carry costs more akin to the old materials. This is an interesting challenge for manufacturers who have significant volume of product made for an international market. They need to run production in two materials which further reduces their production efficiency. As a result, some of this research is to find a ‘global material’ that will suit the lead free requirements, but also meet the lead-leaching requirements of other countries and have an acceptable cost structure. Traditional DZR alloys that are common in Australia are no longer allowable in the USA or Germany, so any manufacturer exporting or looking to export would need to have available alternatives. There are essentially three alternative alloys; those with high copper and silicon, those without any lead or replacement (sometimes known as naval brass) and those with bismuth directly replacing the lead bismuth and lead sit next to each other on the periodic table so they can substitute one for the other. Unfortunately, the brass materials with bismuth don’t have the same properties as lead alloys and the industry is watching carefully to see if the new alloys perform in the field. 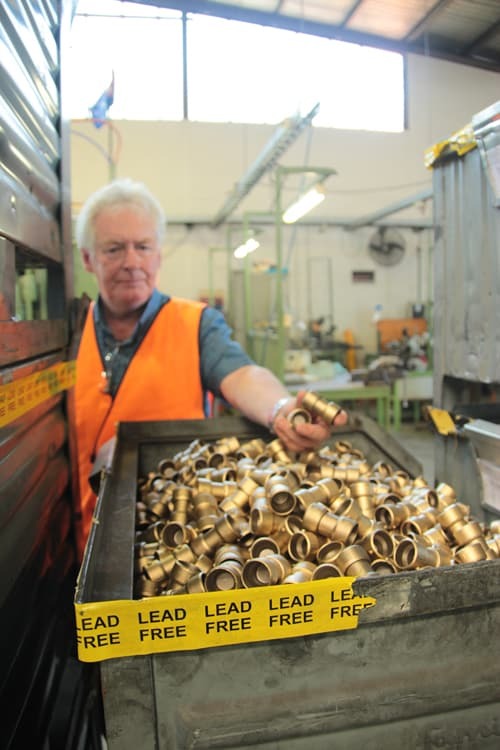 Manufacturers have to work through the issues with each, including the challenge of recycling brass from sources which may contaminate lead-free materials. The good news for Australian companies is that the USA is starting to adopt the DZR requirements we have had in place for more than 30 years and we should see an opening up of the two markets with more common requirements. What are the impacts on Australian plumbers, manufacturers and wholesalers? One of the methods used to meet the requirements of the lead-free legislation is to move to alternate materials, such as polymers or stainless steel components. Tap manufacturers for instance have moved the production of internal, ‘wetted’ components from brass to plastic. Some may see this as a reduction in quality. The product will certainly feel lighter, but it is also possible to create high quality plastic products. Plumbers and merchants in Australia won’t see much difference, as the imported product which has been converted to lead-free or other alloys will be subject to the same tests and will not likely be identified as different. There does not seem to be a community push for removing lead from plumbing here, so they are unlikely to gain a premium price from the angle of quality or environmental benefits. Manufacturers and importers will see a difference in their sourcing discussions. It is now common to be asked if you want ‘lead-free’ during a sourcing discussion. It’s OK for them to say yes, but also important to ask that the products meet Australia’s other requirements, including Dezincification Resistance and Stress Corrosion Cracking Resistance. Dr Greg Morwood is a professional engineer with a doctorate in materials science and manufacturing technology who was involved in the transition to lead free materials through his involvement in the plumbing fittings industry. Greg has 18 years of experience in the manufacturing industry and has been involved in the water industry for 9 of those years. The challenge of developing production processes for lead-free materials opened his eyes to the never ending technological work required for something as seemingly mundane as a plumbing fitting.